Does your medical device company import components, parts, or materials used in the development or manufacturing of new devices? There are specific procedures you must go through to get your imported products through not only the FDA, but also through United States Customs. Today’s guest is John Johnson, a senior associate attorney at FDAImports.com and the Benjamin L. England & Associates law firm. He will talk to us about some of the challenges associated with getting products into the USA. As someone who works carefully with companies comply with pre- and post-market investigations, John is qualified to give some great advice, so you won’t want to miss the interview. The FDA’s role after market clearance is obtained and as it relates to imports. John talks about how the FDA interacts with devices after they are imported. Some thoughts on what is driving the increase of FDA import inspections. How an importer can get through the process of getting permission, having the compliance checked, getting a customs broker, and the other logistics of importing a medical device. Tips on actions to take when various alerts and letters are received from the FDA. Common mistakes that you should try to avoid that importers often make. Why QSR inspections can make or break your ability to work with an international company. Tips for getting through the customs process, which is an issue separate from FDA approval. Jon Speer: Hello, and welcome to the Global Medical Device Podcast. This is Jon Speer, the host, founder, and VP of Quality and Regulatory at greenlight.guru. Let me tell you a little bit about this episode of the podcast. Today, I have John Johnson, he's a senior associate attorney with FDAImports.com, and the affiliated law firm Benjamin L England and Associates. John's gonna talk to us a little bit about import challenges, and some of the issues that you might be faced, as a medical device company, bringing in components, parts, pieces, materials, subassemblies, you name it. Anything that you're getting from outside the United States that relates to your medical device, there are some challenges there. 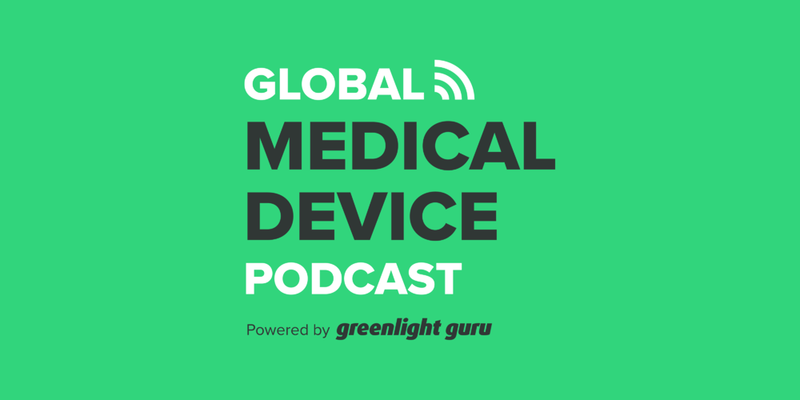 So I hope you enjoy this episode of the Global Medical Device Podcast. 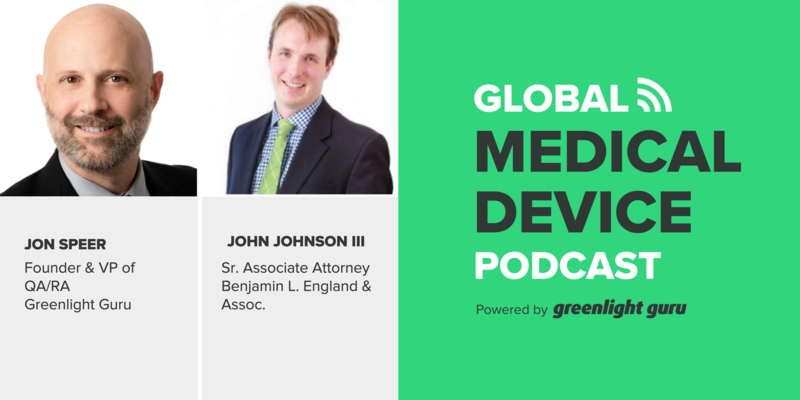 Jon Speer: Hello, and welcome to another episode of the Global Medical Device Podcast, this is your host, the founder, the VP of Quality and Regulatory at greenlight.guru, Jon Speer. Excited about a topic today that many of you, in listening today, and in this market probably are dealing with, and that's this little three-letter organization known as FDA. That's right. With me, I have John Johnson from FDAImports. Let me tell you a little bit about FDAImports and a little bit about John. FDAImports.com is a regulatory consulting firm comprised of former FDA officials and affiliated attorneys. FDAImports helps companies with pre and post market needs, including compliance with FDA, customs, and other state and federal regulations. Jon Speer: Frequently, their team is called upon to help clients obtain release of detained shipments, removal from import alert, and relief from other regulatory enforcement actions. And John is a senior associate attorney with FDAImports.com, and the affiliated law firm, Benjamin L England and Associates. He practices FDA and customs law with a focus on integration of the two agencies, regulatory compliance requirements, and has extensive experience with representing FDA-regulated clients before FDA customs and other regulatory agencies. So, John, that's quite a lot. And it sounds like you get to have a good time dealing with [chuckle] FDA, and customs, and all the things that go along with that. Welcome to the podcast. John Johnson: Thank you very much Jon. It's a pleasure to be here. It is a fun time, because really the international supply chain of all regulated commodities, including devices is now international. According to FDA, 50% of medical devices are now imported into the country. And I think that statistic's a lot larger when you start to consider components that then are manufactured here in the country. So it becomes essential to understand: How does FDA deal with imported commodities, and what are their powers, and the procedures they take? Because I've seen supply chains just get killed due to real simple errors. Had they done a little bit of homework, we could have prevented this. Jon Speer: Yeah. And a short story that from a personal experience that I had, and it's been quite some time and go, but I was doing some work with this startup company, and they had, I don't remember all the details, but they had purchased, or had some prototypes, or something that were being built for them from overseas, I think it was China maybe. But they called me one day in a panic, because the prototype materials that they were trying to receive and evaluate were being held up by FDA at customs. And they're like, "What do I do, Jon?" And I'm like, "I don't know." At the time, I didn't know of you or FDAImports, but I didn't know how to help them. So I'm sure that you could probably get those kind of communications quite often. John Johnson: We definitely do. Jon Speer: Yeah. So let's talk a little bit about kind of that process. And I think a really key thing that sometimes we get caught up in, or we forget about is we really think about FDA as being I guess the agency that allows us, in a premarket fashion, to get our device cleared into market. Sometimes we forget about the FDA's role after we get that market clearance, and sometimes we forget about the FDA's role as it relates to imports, the things that we're purchasing from outside the United States coming into the country, whether that be through contract manufacturers or what have you. Sometimes we forget about that. So let's dive into that a little bit. How does the FDA interact with medical devices when they are imported into the United States? John Johnson: That's a really good kind of starting point. So one of the things to keep in mind is that 510(k) clearance, that PMA approval, that's just your ticket into market. FDA's authority is to regulate once you're in market, are older than those pre-market kind of steps. And so, the FDA's role at this point is to ensure compliance. And so they're going to examine products, they're gonna be looking at compliance. And the paradigm in the United States of FDA's enforcement mode and investigation mode is that facility inspection. So they'll knock on your door unannounced. And here they come. Well, as you can imagine, that's really hard to do with devices that are made abroad. John Johnson: Just the mere logistics of getting an investigator out there. John Johnson: So they don't have to persuade a third party. They just have to convince themselves. "Yeah, that looks like it's probably not in compliance." John Johnson: To really kind of control that thing, because they can't do those physical inspections and such. And so the Congress gave FDA the special power on imports since there's not the same boots on the ground approach to say, "Okay well, we're gonna make your burden less to ensure the quality and the safety and the compliance of imported medical devices." And this is true for foods, drugs and cosmetics as well. And so that's really kind of FDA's... How they approach imports or one of their key powers. Jon Speer: Yeah. Just a lot of things kinda triggered as you talked about that. And one of the things that has been interesting is, on FDA inspection of foreign establishments has actually been increasing quite a bit in recent years. And I guess I'm curious if... Maybe you don't know. Maybe it's anecdotal. But do you feel like this, import action, these sanctions that FDA may take on things coming into country, Do you feel in any way shape or form that that might be a trigger to what's driving that increase in FDA inspection of foreign establishments? John Johnson: Well, but they're just two different tools and they ask different questions. John Johnson: That if you see a pattern of failures you start to say, "You know what? I bet there's a quality problem." And so it may drive FDA to do a foreign inspection. So say they see some import failures. They may then schedule a foreign inspection saying, "Maybe this is a fluke or maybe there's a greater problem?" Jon Speer: Right. So that almost is implying that, and I don't know, but this is almost implying that FDA is tracking and trending this data and information. And, are you finding that that's the case? John Johnson: Oh, definitely. They have some very powerful tools. John Johnson: Track and trace and trend. So one of the things when you have a foreign inspection, a lot of times you'll get a compliance report from FDA saying, "Here's all the imports you've made." John Johnson: "And here's all the times I refused you an why I've refused you." And that's in preparation for that foreign inspection. John Johnson: So FDA keeps a report card on you. John Johnson: If they're seeing a failure in one company's device, they may say, it may be just that company has a problem or there may be a categorical problem across the board of that device. So they'll start examining other people's device... Same style device, to see, "Is it a device problem or a company problem?" John Johnson: And so they have a lot of powerful computer tools that, analytical tools, that help them target their resources. Jon Speer: Sure and how... If I'm sitting at my medical device company here in the United States and I've purchased something from a foreign business, someone, a business outside the United States, and maybe that syringe or a component or maybe they've manufactured a finished device. And FDA says, "I gotta stop this. I gotta put this on hold," or whatever the proper terminology. How do I find out about this? What's the process? How does that happen? John Johnson: So, one of the most important things is... Practically speaking, a lot of this is done through a customs broker. So, to import an article in the United States, you have to file entry. So, you basically write a letter to the government saying, "Hi. I would like to import this article. Here's what it is. If I owe any money, here's the duties I'm gonna owe you." And in that process, you also send a bunch of information to FDA who then reviews the compliance of the article, or whether it wants to examine it. That information is all submitted by someone known as your customs broker. They may work with your freight forwarder. So the guy who got the logistics together to get your device from China, Germany, or wherever to your warehouse. John Johnson: Usually, with them, they would partner with a customs brokerage firm. And so, that broker is going to be really your key data point, because what they're gonna get in their systems are live updates saying what's going on with the FDA compliant... The FDA status of your article. So, you wanna select a broker who really values that customer relations and keeps you in the loop. John Johnson: The other way you find out is, FDA will issue at certain critical point something called, "A notice of action." They mail this to your office, they also mail them to the office of the broker. And say, you are consigning the goods to a third party, the consignee gets in the notice. And in these notices, FDA says... They may tell you that they're examining your shipment, that it's on hold pending that. They may tell you that, "You know what, we think it's not in compliance," and they're gonna explain to you why it's not, tell you who you have to respond to. And if you don't respond in time, those goods are gonna be refused. And then finally, assuming you went that far, you're gonna get one last notice, which is either a refusal notice because you didn't respond, or because FDA wasn't persuaded by your explanation as to compliance, or you'll get a release notice. And so, your broker is really your key point, but also FDA is physically gonna mail you some things at certain junction points. Jon Speer: Okay. And so, what do I need to do whenever I get these notices or these alerts, or what kind of action should I take? I understand the importance of the broker, but it seems like I am culpable, or should be reacting, or responding in some way as well. John Johnson: So, certainly. So, when you're an importer of record, you have a bunch of legal obligations to the government under customs law but also under FDA law, because you've now introduced an Interstate Commerce and article just by crossing the border. John Johnson: You're part of that supply chain. So, the first thing to do is when you have that hold, you make sure those goods stay on hold. You're not allowed to distribute them, pending the holds release. So, that doesn't mean you're not allowed to take them to your warehouse, but you better make sure that you don't process them or you don't send them to the end user and lose control. The next thing is what you have to do really depends on what's being asked of you. So it may be that the government wants to come out and physically examine the goods. A lot of times these holds are not at the port. What happens is the goods are released to you conditionally, and you're allowed to take them to your warehouse. After you've been at this point, we'll ask you, "Hey... " Or not ask you, they're gonna tell you. [chuckle] "We're gonna examine these goods, give me the address. I'll see you." And then, they schedule an appointment, they come out and examine the goods. Sometimes, these goods... These examinations are just paper examinations. John Johnson: Now, after that point, after you think everything's is great, they'll give you a release notice, and you're welcome to distribute them. Or they may say, "I think they appear to violate the act." At this point, you need to understand what FDA is alleging is wrong, and then you need to assess how you either can fix the problem, or what evidence you need to persuade FDA that the article's in compliance. So a lot of times, devices may get held up because the wrong device listing number's given to FDA. John Johnson: So, you may be able to just straighten it out by saying, figuring out, "Oh, the wrong went to FDA." giving them the right device listing number, and possibly some supporting documentation, FDA then, may release the article. Depending on the situation, you may actually need to get it tested by a third party to demonstrate compliance with certain specifications. Jon Speer: Okay. I'm assuming there's probably some really basic common issues or mistakes that an importer can be aware of and ensure that don't happen to prevent these types of issues from happening with FDA. But what are some of the bigger issues or the more common issues that you've seen in your practice? John Johnson: Certainly. So, the first thing is, as silly as it sounds is, know why you're importantly article. John Johnson: And know exactly, are you bringing this in safe as a prototype for research and development? Are you bringing it in commercially? Is it a component that can be used on its own, or is it a component that has to be assembled with something else to have a medical function? John Johnson: You need to first know why on earth you're bringing this thing in, 'cause it could lead you to the next question. Have I met all the regulatory requirements for my use? Because there are some big differences between say, a component that can be used for medical purposes, versus a component that can't yet be used for medical purposes, 'cause it implicates your registration and listing requirements? And so, if you're not clear on that, I've seen a lot of companies get themselves into trouble because they, since they don't know what it's for they don't make sure they're meeting all the requirements. John Johnson: Related to that then, is okay now once you know what it's for there are some key things FDA always look for with devices, if registration and listing's required, you gotta make sure you have that and you gotta make sure that you put it in the right numbers. I've seen too many firms know that it needs to be registered and listed and just on the documents, put in the wrong numbers, and so that will cause holds. Also, if it's a 510(k) device, that 510(k) number or that PMA number, those are things that FDA screens for every imported device because they can do it through the electronic submission. John Johnson: And so literally it's your number is compared against FDA's database, and if there's not a match FDA holds it. Jon Speer: Okay, alright, well those seem like things that are very much in my control and pretty simple and straightforward. So how often are there issues, is this a big deal? Obviously, FDA imports, is in business for a reason. So I'm guessing that this is somewhat of a big concern and are the trends... What else, what else? This can't be that simple John, what else is there, and come on? John Johnson: Well, so FDA becomes really commodity specific, so if you're bringing in say medical gloves FDA always are testing these things for pinholes, bringing glasses, FDA's always making sure that they're not shatter resist... Or that they meet the impact resistance requirements. So there are certain devices FDA always examines because they've seen a history of compliance issues and so they're always on the look out. And then some of it is just those registration listing issues. When we talked about foreign facility inspections one of the ways that some companies get themselves in some really big problems is they have that foreign facility inspection, they get a 483, they don't take that 483 seriously. FDA concludes that you know what, there are some possibly significant QSR issues. They're gonna issue something called an import alert where FDA basically tells the field any time you see this device from that company stop it and subject it to refusal unless the importer can persuade you that this specific group of product is in compliance. John Johnson: Now, some things you can test compliance and show FDA, "Look I fixed it." Or say, FDA doesn't... You don't have a 510(k) and FDA thinks you need one, you may be able to fix that by getting the 510(k) or because you took a class one exempt device, you made some really aggressive claims, you changed your labeling, so you solved that problem. Those you can solve, those QSR inspections FDA's gonna say that company is basically black listed from the United States. John Johnson: Until they solve that QSR problem and say, have meetings with FDA and possibly FDA does a re-inspection, and only after that is that company allowed to export again and so that becomes a real killer, 'cause no amount of providing test reports or manufacturing documents for individual shipments, when you're on a QSR import alert is gonna convince FDA generally speaking. Jon Speer: Wow, yeah I mean. John Johnson: It really becomes an import embargo. Jon Speer: I'm really on the edge of my seat now because you mentioned a couple of things that if I get this import alert, I mean that's a big deal. And then you mentioned a couple things to be able to address that, I might need to file and get a 510(k) clearance or I might need to have a follow-up FDA inspection while I know how long getting a 510(k) through FDA and cleared can take, and that's months and months and months, best case scenario, and then going through an FDA inspection and being successful with that and addressing and mitigating any potential reasons, that's gonna take months and months and months, so these are not short term ways to be able to address a situation, if you happen to get one of those import alerts, that seems like a pretty big deal. John Johnson: Exactly and so that's why I kind of talked about, what seemed almost hokey, we both laughed on it, is know you're importing and make sure you got all your compliance boxes checked. John Johnson: And that's true. Know why you're importing and check the compliances, if you're using a contract manufacturer or a supplier, a third-party supplier, do your due diligence which you really should be doing anyways, as part of your purchase controls and make sure you know what their compliance status is. Ask them questions, "Have you recently been examined by FDA or had a facility inspection?" 'cause one of the things you asked about earlier was, Well does FDA trend this data? And the answer is definitely. John Johnson: I've seen situations. And this is quite common, where say their foreign supplier has two US buyers. You're buyer one. You've had been importing this forever everything's fine, buyer two comes along they have an import issue back to the manufacturer and then can trickle down to you. And so while you never had a problem, and FDA has not examined you and said, "You've had a problem." because of one of your foreign suppliers, other customers having an issue on imports, that can affect you. Jon Speer: Oh wow. Sure, yeah, so folk that's very important. I know there's a lot of you that may be considering manufacturing your products with outside US resources and that might be all fine and good, but do your homework. That's what I'm hearing John tell us, do your homework, make sure that that particular contract manufacturer has a clean bill of health, so to speak, with the FDA and doesn't have any of these import alerts or any other sort of infraction. So, John, so far, we've talked a lot about the FDA side of things, but there's kind of a different side that's also important to understand, what about the Customs side of things? John Johnson: Yes, so US Customs has a different role. So FDA's job is to the safety of its commodities, ensure consumer protection, to protect it from fraud, so safety and fraud. US Customs has a different job, its job is to protect the Treasury of the United States, among other than little assignments. So other than the IRS, US Customs is the one collecting money for the Federal Treasury, so they have a slightly different mission. And one of the key things is they're a tax collector. John Johnson: You're gonna need to make sure that the way that you classify your device, the way that you value your goods are all appropriate, so that when you're declaring them to Customs, you're paying the appropriate duties, taxes that you need to. And included Customs has other missions they protect intellectual property rights, they also ensure those country of origin markings "Made in China" or "Made in Brazil" That's a Customs issue. And so you're gonna need to make sure that your commercial documents are aligned to those Customs requirements 'cause your invoices impacting less need to look a certain way, and convey certain information. You need to make sure all the things on there are truthful 'cause Customs has some better powers than FDA, so FDA's main power is they can just kick your goods out and if they wanna do anything more, they actually have to take you to court. Well, Customs has a bunch of penalty authorities that it's allowed to use administratively, so they don't have to go to court. So it's important to make sure that you get your declarations right because Customs job is to protect the revenue of the United States and so those things become very important. Jon Speer: Yeah, okay. I tell you that this conversation has... I'm sure we're just skimming the surface today, but it's been really kind of eye-opening to me, and I'm gonna confess, I had no idea how much of this was happening. And all of the twists and turns that can happen to those who are bringing in products, materials, components into the United States for use in medical products. It's very helpful to have this sort of information. So I guess John, one last question I have for you before we wrap things up, is there anything else that you think is important for listeners to understand about FDAImports.com's business as well as how this impacts their products with respect to FDA and Customs and any other state and federal regulations? John Johnson: The big thing, and you've heard me say this time and time again, do your homework on the front-end. And that includes FDA and Customs and also seeing if there's any other government agencies that may be involved in your commodity. Think about heart valves, heart valves usually use porcine products. USDA has something to say about that. If you're bringing in foreign manufactured porcine, or not foreign manufactured, but pig guts basically or pig heart parts from a foreign country, USDA has something to say about that, in addition to FDA and Custom, 'cause the key thing is to do your homework, because at some point one of these agencies is gonna examine you and if you've not done your homework, you're likely gonna get yourself on a hold and that hold maybe will want it done, or it could lead to a much larger compliance issue, where suddenly your supply chain has just ended because these government agencies have a mission, an important mission and saying, "Well I'm sorry, things aren't perfect but I have to have this product so I can stay in business." is not a persuasive argument. John Johnson: You need to make sure your compliance is in order. And so, we're there to help companies when they do have those holds, 'cause sometimes the agencies are incorrect in their analysis or their approaches, but many times, they are right, and so I'd much rather be working with firms before they make those shipments, before they start that supply chain, so that when they do get that hold, it's more of a one and done rather than their whole supply chain is shut down and it could take them months. And I've seen, even years to re-open certain channels. Jon Speer: Yeah, so folks, listen to John, do your homework. I would recommend part of your homework be reaching out to John Johnson, and FDAImports.com and they are experts in this space. You don't have to go learn all about FDA Customs and all the import alerts and all the twist and turns that can be encountered in this. They already know this, they've built a business around this, they're here to help, they are experts. So do reach out to FDAImports.com and connect with guys like John Johnson, and others on their team. John, I appreciate you being a guest on the Global Medical Device Podcast. I know we've got a webinar that's coming up soon, and certainly as that becomes closer and more identified as far as the topic and details we'll certainly let the greenlight.guru listening audience know all about that as well. So do pay attention to that, that is gonna be coming up here very soon. John Johnson: Well, thank you very much Jon I really enjoyed the time and having this conversation. Jon Speer: Alright, well, of course, if you need help with your quality management system, or you have some questions or comments, and you need to know or what the QSR means to you and your company, you can always reach out to the team at greenlight.guru. This is why we exist. We built a software platform to help you ensure that your medical device company meets all of those applicable quality system regulations here in the United States, as well as any other regulatory and quality requirements such as ISO 13485 and ISO 14971. So, do go to greenlight.guru and request more information if that's something that we can help you with. Once again, it has been your Founder and VP of Quality and Regulatory and the host of the Global Medical Device Podcast, Jon Speer, thank you for listening.